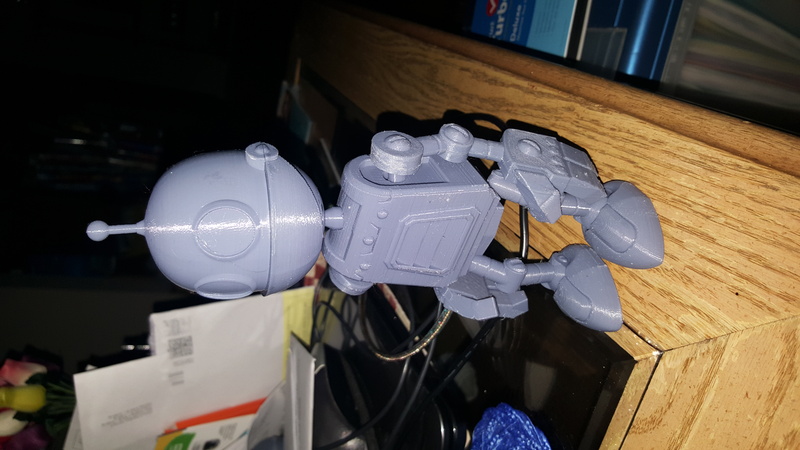 This is a 3D printed Clank model from the video game and movie Ratchet & Clank. At the scale given, it'll end up being about 6 inches tall. I created this model in Fusion 360 and printed it on my Robo 3D R1 printer using Hatchbox White PLA. Step 1: Assemble and glue the pieces together using super glue. Step 2: Prime the model with plastic primer. Step 3: Paint the metallic finish on him, we used Krylon Hammered Metal spray paint through an airbrush. Step 4: Paint the details. We used water based acrylic paints with a paint brush to get the dark gray, green, and red areas painted. Something to keep in mind while assembling is his position. Try to position his arms and legs so that he'll stand on his own and not fall over.